ST. GEORGE — Among all the other categories Utah has been ranked in by blog writers, Utah’s Lt. Gov. 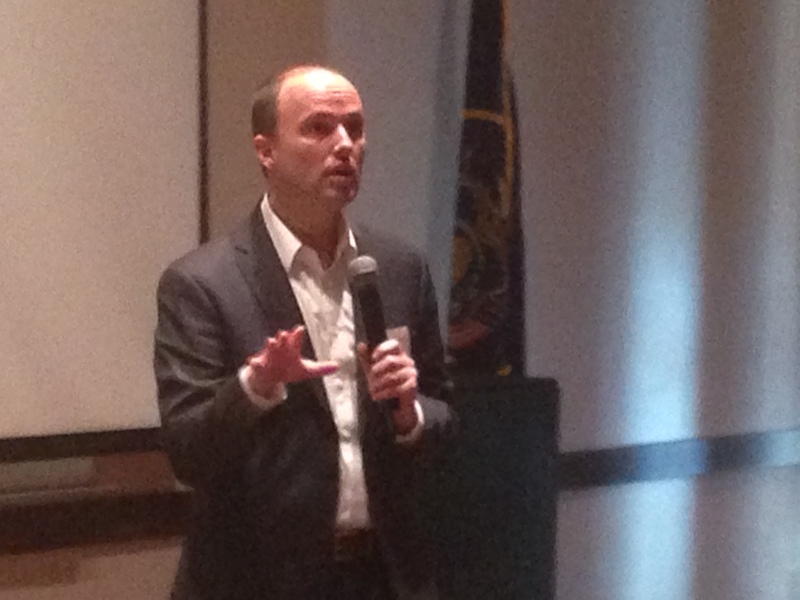 Spencer Cox spoke to one of them at Washinton County’s 2015 “What’s Up Down South” economic summit at the Dixie Center St. George Thursday: Utah named the nerdiest state in America. “The Nerdiest State in America,” from the Estately Blog, was also the title Cox led off with as he discussed with his audience changes in technology throughout the years and how those have changed business. Utah’s top numbers included: Anime movies with 14, Dungeons & Dragons with 15, and Magic: The Gathering with 18. All ranked per capita, according to the blog. 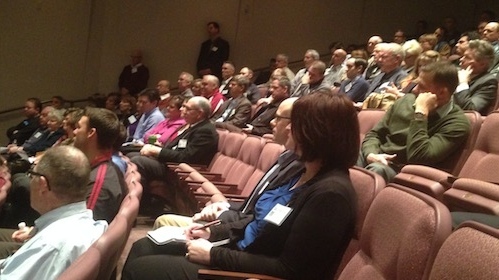 “In Utah, nerdishness is so common it’s practically the norm,” Cox said, quoting the blog. Cox related the analysis to changes in society. Kids in this century don’t know what a printed encyclopedia is, he said. He grew up in the small town of Fairview, where the population was an estimated 950 in 1975, and 39 years later has grown to about 1,200. While his father was attending college, Cox said, his great uncle passed away and his grandfather was battling cancer. His father had to come home and help on the farm with his cousin as well as work for a telephone company. At that time, in the 1980s, the town of Moroni was for sale for about $1 million, he said. The telephone company was on the verge of bankruptcy. The bank offered the amount to the company if they mortgaged everything including the home and farm. Continuing his example, Cox said that tough decisions and risks were made that in the end helped multiple businesses besides the telephone company and farm. As the telephone company changed and grew – as well as towns and cities in the area – so has the ability to communicate, he said. In discussion with the audience, a few different ways information is communicated as a result of technological changes were mentioned about the changes brought by technology. Other changes are how news is consumed and how technology impacts privacy of information. Newspapers and nightly news used to be the way to know the news in the 1980s, Cox said. Not anymore. “Technology is good but can also not be good,” he said. A strange and garbled story. The headline led me to believe this was going to be a story about Utah’s high-tech industry related to this “economic summit.” Instead, it’s a story about kids and/or adults playing games. Hardly a newsworthy topic in a world where technology is the driving force and technology companies are leading the way financially. Either Mr. Cox did a disservice to his audience by focusing on his personal story and not the economics of the high-tech industry or the reporter did a disservice to him and readers by not reporting beyond the personal story. I’m inclined to think that Mr. Cox did not understand the meaning of an “economic summit” which is generally considered a place to talk about economics rather than family history. I don’t think being the “nerdiest” state is anything to brag about when the nerdiness is in this case just people banging away at games and entertainment websites and not people engaged in advancing technology or the technology-tied economy. Further, I think Mr. Cox’s self-indulgent family story did nothing to advance Utah’s stance in this new world or to shed any light on where Utah might be going in the future with regard to technology. The state might begin by upgrading its own websites. Being the nerdiest state in the country is something I am VERY proud of. I think you would be surprised at the people who attend conventions and like the things listed above. I’m a college graduate, own my own home, and have a job, as does my husband. We both cosplay at conventions; I’m a Harry Potter nerd and he’s a Trekkie. His sister, a current college student on a full-ride due to her amazing high school record or activities, also cosplays with us. We all love anime, fantasy lit, and especially Doctor Who. If you know anything about Doctor Who, it’s actually quite complex and thought-inducing. I too thought the article would be about more, and find the whole thing garbled and as if the writer had ADD or Tourrette’s or something. It’s true that the Internet has changed our youth forever – no one goes to dictionaries or encyclopedias for information; No one even goes to libraries for books when they have a research project! With a tag like “arts and letters”, the fluffy stuff of academia, I would think you might find some semblance of comprehension of what Cox had to say. Did you, in fact, attend the summit? If not, then I would label you dweeb of the week. Utah is the Koolaidiest place in the world. Drink up! Gotta beat sage on this one. He’s fast.. Dang tweekers. LOL.! Crap…. I had to read the whole article before I actually found out it wasn’t about nards! I read the entire story and understand the basic fundamental of nerplexia as a form of negative reintroduction of the similarity between both factions of the biological simplicities of letter writing. It was quite an informative article.